When she arrived, she was comforted in her decision by a calm assurance that she was doing what God had called her to do. As nun and monastic in Northumbria, she learned quickly about the life of one devoted to prayer and service. So quickly that soon she was appointed abbess of a local convent. She wore the pectoral cross of the abbess and led her sisters in Christ in lives of prayer to and adoration of God. The sisters loved her and fittingly called her "Mother." 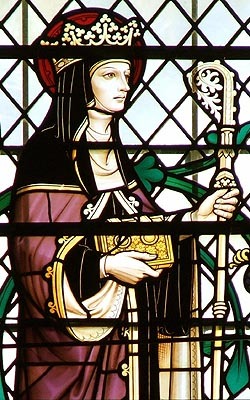 It seems likely that this monastery was a "double monastery" in the Celtic tradition and would have involved both men and women living in separate houses but worshiping together.As most of the Celtic monasteries, it was not uncommon for the abbess of the nuns to lead both houses in worship. 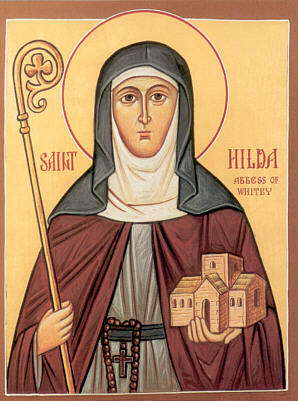 After a year or so, she was called away and appointed abbess of the new monastery at Whitby.